NEW YORK CITY (April 19, 2017) – The New York City Department of Transportation (NYC DOT), in collaboration with the Chinatown Partnership and Van Alen Institute today launched Gateways to Chinatown, an initiative seeking innovative proposals to plan, design, and construct an iconic contemporary neighborhood marker at the nexus of Manhattan’s Chinatown and the southern entrance to Little Italy’s historic Mott Street. Straddling art and architecture, symbolism and function, the new structure and public space aims to become a vibrant place of exchange at the center of one of New York City’s most dynamic and historically rich areas. The overarching goal of Gateways to Chinatown is to provide a new landmark for Chinatown and the surrounding neighborhoods that will engender pride of place, embody cultural and social identities, and stimulate economic development. This new structure and public space will be located on a triangular traffic island in a key pedestrian area bounded by Canal Street, Baxter Street, and Walker Street, informally known as the Canal Street Triangle. Gateways to Chinatown invites design teams from a range of backgrounds to submit proposals to activate the space, honoring neighborhoods past and present while incorporating interactive technologies and enhanced green space. The team, which will be selected later this year, will have a $900,000 budget to design and implement their proposal, and will begin working with the community in early 2018. "Tapping the creative energies of New York City to create an innovative public space at the gateway of Chinatown on Canal Street is a win-win for the neighborhood, and for the creative community," said Manhattan Borough President Gale A. Brewer. "I look forward to seeing the results!" "I look forward to working with the community as the Gateways to Chinatown project begins to take shape," said Assemblymember Yuh-Line Niou. "The Gateways project presents the opportunity to celebrate lower Manhattan's rich culture, and to attract visitors to our local businesses and community. I commend the City and all the project partners as Gateways to Chinatown kicks off." Gateways to Chinatown is the result of two years of careful planning and collaboration between NYC DOT, the Chinatown Partnership, and Van Alen Institute. This project responds to a widespread desire for an iconic district marker and is a result of decades of neighborhood advocacy and planning. In August 2016, the three organizations launched a public forum to allow community members and stakeholders to share their hopes for the site and ideas for a suitable district landmark. Following the forum, NYC DOT Street Ambassadors reached out to residents and visitors on-site to gather additional feedback through surveys. Building on this public outreach process and numerous previous plans, Gateways to Chinatown seeks to understand how a neighborhood gateway can respond to tradition as well as adapt to ever-changing cultural demographics. “To create a landmark is to create a pivotal social and cultural intersection for people and public space,” said Van Alen Institute Executive Director David van der Leer. “At Van Alen, we see Gateways to Chinatown as an opportunity for designers to envision the landmark of the future, with a special focus on the energy of Chinatown–a unique epicenter of urban life." In addition to initiating the Gateways to Chinatown project, this summer NYC DOT will activate several other important gateway locations with temporary art, and convert nearby Doyers Street to a pedestrian shared street. ** For a link to the Request for Proposals (RFP), as well as high-resolution project images, please visit Gateways to Chinatown. Proposals must be submitted to NYC DOT by 2:00pm, June 19, 2017. This project is made possible by a grant from the Lower Manhattan Development Corporation, which is funded through Community Development Block Grants from the U.S. Department of Housing and Urban Development, and the Manhattan Borough President’s Office. The New York City Department of Transportation's mission is to provide for the safe, efficient, and environmentally responsible movement of people and goods in the City of New York and to maintain and enhance the transportation infrastructure crucial to the economic vitality and quality of life of our primary customers, City residents. With over 5,000 employees, the Department of Transportation oversees one of the most complex urban transportation networks in the world. DOT’s staff manage an annual operating budget of $900 million and a five-year $10.1 billion capital program, along with 6,000 miles of streets and highways, 12,000 miles of sidewalk, and 789 bridges and tunnels, including the iconic East River bridges. At Van Alen Institute, we believe design can transform cities, landscapes, and regions to improve people’s lives. Building on more than a century of experience, we develop cross-disciplinary research, provocative public programs, and inventive design competitions to address the most pressing social, cultural, and ecological challenges. 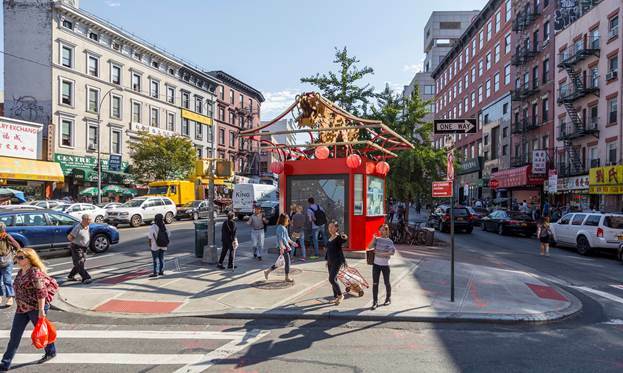 Gateways to Chinatown is one in a series of Van Alen initiatives seeking to create new, design-driven public spaces for cities and communities around the world. Also included in this series is Van Alen Institute’s annual Flatiron Public Plaza Holiday Design Competition asking interdisciplinary teams to design and build a highly visible temporary landmark at the heart of the Flatiron District that is the centerpiece of the Partnership’s annual holiday programming; Opportunity Space, an international design-build competition challenging multidisciplinary teams to propose a temporary, mobile structure that will support economic opportunity and social inclusion in Malmö, Sweden; and Crossroads Conversations, a public program series hosted at the base of the Red Steps in Times Square that invites passersby from all walks of life and political convictions to engage in thoughtful dialogue on some of the most pressing issues of our time in an iconic public space. The Chinatown Partnership, led by Wellington Chen, was formed in 2006 as a new start-up from the ground up to bring residents, business owners and community groups together to rebuild Chinatown following 9/11, and to preserve the neighborhood's unique culture while ensuring its vitality into the future through strategic positioning. The Partnership helps promote the area as a special destination to live, work, and visit through the highly-popular Weekend Walks street festival series, Mid-Autumn Festival, annual Beautification/Earth Day, East-West Parade with Little Italy, Double-Seventh Valentine’s Day, Lunar Stages outdoor film screenings, Taste of Chinatown street events, and Explore Chinatown marketing initiative.